APEC Ultimate high capacity pre-filter set is made in USA with high quality filtration components to provide a longer lasting filter set to protect and prolong the lifespan of your reverse osmosis system. Premium quality filter set lasts over 12 months for fewer filter change outs and high performance contaminant removal. 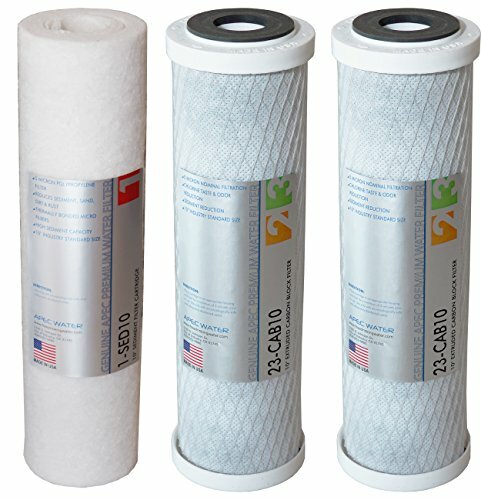 These standard size filters are 10" and compatible with all standard size under counter RO systems. 1st Stage: High-Grade 10" high-capacity polypropylene sediment filter -removes dust, particles, and rust. 100% pure polypropylene depth filter with exceptional dirt-holding capacity translates to longer life and fewer change-outs than existing string-wound or resin-bonded filters. 2nd and 3rd Stage: Premium Extruded Carbon Block 10" -gets rid of unpleasant chlorine, tastes, odors, cloudiness and colors. Also removes VOCs and other common chemicals from the water. APEC's extruded carbon block filters consist of activated carbon particles fused into a uniform block with enhanced adsorptive capacity and efficiency. Unlike granular activated carbon (GAC) filters, these extruded carbon block cartridges will not channel or bypass due to the extreme uniformity of their extruded activated carbon core. Compatible for APEC RO-45, RO-90, RO-PERM, RO-PUMP and all other standard size under counter reverse osmosis systems. About APEC For over 17 years, APEC has been an industry leading manufacturer who specializes in high performance RO systems. As the original manufacturer, we have dedicated a knowledgeable and sincere team that is committed to providing customer satisfaction in hopes to bring many years of enjoyment and good health for you and your family.